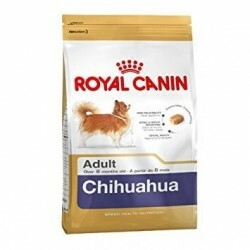 The I think dry Royal Canin Maltese Adult is indicated for the diet specific for adult dogs of the breed bichón maltese (from 10 months). Your formula takes into account their particular characteristics, that is why the emphasis in the care of their skin and their fur and keep it in constant growth. Royal Canin produces all of its products from the respect towards the animals and looking for the quality of the raw materials and the production processes. To make animal feed, dry or wet, takes into account the type of race, your size, your age, your lifestyle, etc to be able to create the formula that best suits each dog. The bichón maltese has a name that makes reference to the island of Malta but you can not ensure that the origin of this breed is found there. Dogs are small, very elegant, and playful. His good nature makes it ideal for home life as they are quiet and do not need much space. Your primary identity is your hair long and silky, brush it daily and take it to the hairdresser at least a couple of times a year. To get a protective barrier of the skin, promote the renewal of the hair and keep it white and bright, this feed includes fatty acids, sulfur, omega-3 & 6, borage oil and biotin. 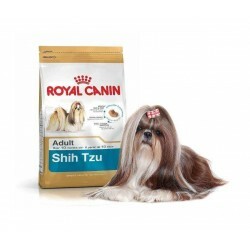 Royal Canin Maltese Adult it also ensures the optimal mineralization of bones and a protection to articulate thanks to its high content of chondroitin, glucosamine, calcium and phosphorus. And presents a high level of protein (24%) so that you can develop muscles strong and toned. Dogs are very sensitive to external agents, and often suffer usually allergies dermatological. To avoid these inconveniences Royal Canin enriches food with vitamins of the B group that protects your dermis and prevent it to become inflamed and pink. In addition, it has been enriched with antioxidants and amino acids that strengthen their natural defenses. 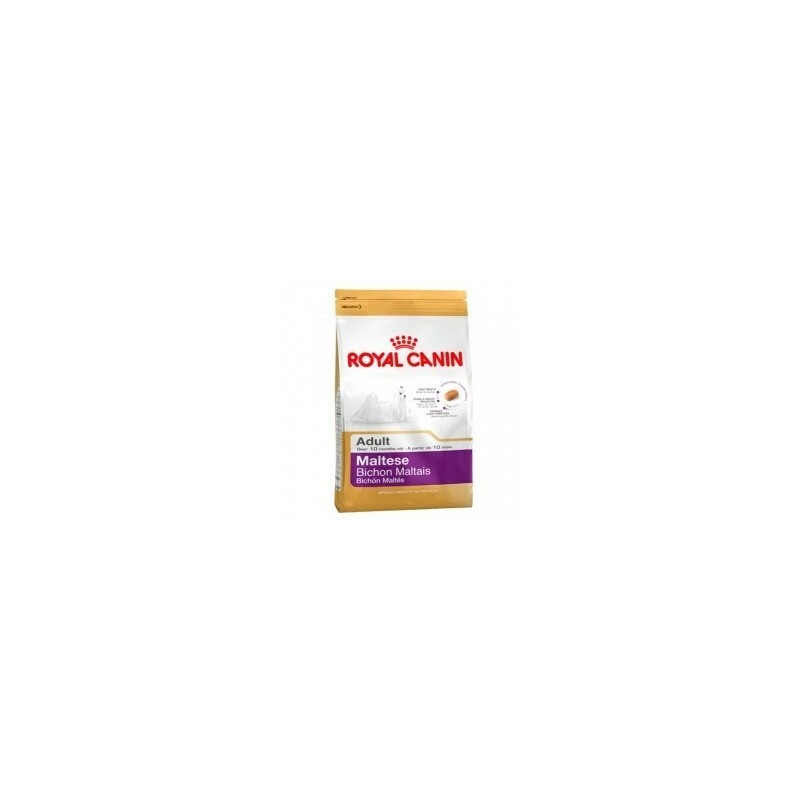 The formula developed by Royal Canin helps reduce the odor of their feces and their quantity, and to protect your digestive tract. Their croquettes exclusive help them to maintain good oral hygiene and have a design that adapts to the size of your mouth and facilitates chewing. 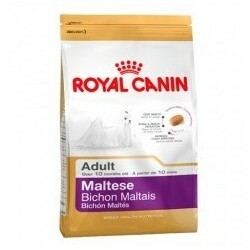 Royal Canin Maltese Adult gives them all the nutrients that taste delicious thanks to its combination of aromas. I think for the daily feeding of dogs bichón maltese. The B vitamins protect your skin avoiding allergies. Enriched with antioxidants and amino acids that strengthen their natural defenses. Its ingredients retain all their nutritional properties. It has an exquisite flavor. 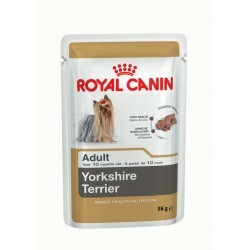 Dry food, complete and balanced, suitable for the daily feeding of adult dogs of the breed bichón maltese. Ingredients: corn, rice, animal fats, dehydrated poultry, protein, pork powder, corn flour, isolated from plant proteins (LIP-protein selected by its high assimilation), hydrolyzed animal protein, pulp of chicory, soya oil, minerals, fish oil, yeast, fructooligosaccharides, borage oil (0.1%), extracts of green tea and grapes (source of polyphenols), hydrolyzed from crustacean (source of glucosamine), extract of rose of the India (source of lutein), hydrolysed cartilage (source of chondroitin). Constituents analytical: crude protein (24%), oils and fats gross (18%), crude ash (5.5%), crude fibre (1.4%), starch (36.5%), moisture (9.5%), calcium (0.7%), phosphorus (0.7%), vitamin A (31000 IU/kg), taurine (2000 mg/kg), lutein (5 mg/kg), dietary fibre (6.5%), linoleic acid (3.75%), arachidonic acid (0.07%), glucosamine chondroitin (500 mg/kg), essential fatty acids omega 6 (3.96%), essential fatty acids omega-3 (0.72%), biotin (3.07 mg/kg), chloride, glucosamine (495 mg/kg), vitamin C (300 mg/kg), vitamin E (600 mg/kg), EPA/DHA (0.3%), extract-free nitrogen (ELN) (41.6%), methionine cystine (0.75%), DL-methionine (0.46%), polyphenols from green tea and grapes (150 (mg/kg), arginine (1.47%), L-lysine (1.08%). Minerals: magnesium (0.07%), sodium (0.4%), iron (144 mg/kg), manganese (77 mg/kg), zinc (236 mg/kg), iodine (5.7 mg/kg), selenium (0.28 mg/kg), potassium (0.7%), copper (14 mg/kg), chlorine (0.67%). Vitamins: folic acid (13.6 mg/kg), choline (2,000 mg/kg), vitamin B1 (thiamine) (27 mg/kg), vitamin B2 (riboflavin) (48.6 mg/kg), vitamin B5 (pantothenic acid) (145.2 mg/kg), vitamin B3 (niacin) (482.9 mg/kg), vitamin B6 (pyridoxine) (75.7 mg/kg), vitamin D3 (800 IU/kg), vitamin B12 (cyanocobalamin) (0.13 mg/kg). Nutritional additives (per kg): vitamin A (29500 IU), vitamin D3 (800 IU), biotin (3.07 mg, E1 (iron) (52 mg), E2 (iodine) (5.2 mg, E4 (copper) (10 mg), E5 (manganese) (67 mg), E6 (zinc) (201 mg, E8 (selenium) (0.11 mg). Additive technology: triphosphate pentasódico (3.5 g). Served I think with the help of this table of recommended daily ration. Keep in mind the activity of your dog and that the quantities are indicative.